More than a watch Tissot, Innovators by Tradition. Dear Readers, Time has come to sit back and relax! If you hold this magazine in your hands, chances are that you finally have found a moment to enjoy some well-deserved and longawaited quality time. Whether with your lover, your family, your friends or just yourself (as we often forget), this winter issue invites you to join us for a special journey as we bring you some fresh ideas of where to spend some of that quality time in the magical landscapes of Switzerland. For those of you who like horses, speed, steam and sturdiness, Noah Joseph, our automotive expert and wordsmith, offers you insight into the world of wonder machines on wheels. Exclusive distribution in luxury hotels, exclusive boutiques, airport and executive lounges, golf resorts, private limousine services, Swiss embassies, special events and exhibitions. The magazine is also available at selected newsstands and bookshelfs. All the published material has been provided by the mentioned brands. Therefore, Swiss Made Magazine cannot be responsible for copyright issues and assumes no responsibility on inaccurate information or changes in the products or prices displayed. Copyright by SwissMade Magazine. Reproduction or use of the content in whole or in part without the written permission of the editor is strictly prohibited. Accessories 96	A sophisticated â&#x20AC;&#x153;noseâ&#x20AC;? Set against the magnificent alpine backdrop of the Upper Engadine, the high society of horse racing come together and enjoy St. Moritz’s proverbial ‘champagne climate’. White Turf, the modern-day horse racing meeting, is renowned far beyond the Swiss borders, is the fascination of the noble thoroughbreds from all over Europe that fly across the flattest racecourse in the world, carrying international jockeys sporting the colours of prestigious racing stables. Staged since 1907 in its firmly established tradition, White Turf offer a multitude of spectacular events. The gallop and trotting races with noble thoroughbreds from all parts of Europe and international jockeys. On three Sundays in February, more than 30,000 spectators from all over the world flock to the frozen expanse of the Lake of St. Moritz to witness the excitement and entertainment of the races against the magnificent backdrop of the mountains of the Engadine. Skikjöring, a discipline in which daredevil men on skis are pulled along a 2,700-m-long track by unsaddled thoroughbreds at speeds of up to 50 km/h over a crunchy ice, is exclusive to White Turf and invariably has the crowds in raptures. Courage, stamina, strength and skiing skills will decide who collects the greatest number of points over the three race Sundays in order to be crowned ‘King of the Engadine’ for a whole year. ‘It is not only the exceptional venue but also the style and ambience of this social and sporting event attract guests from all over the world and celebrities from the worlds of culture, business and politics year for year,’ notes Rudolf Fopp, President and CEO of White Turf. Besides the horse races, White Turf St. Moritz offers a highly attractive fringe programme, including two interesting musical performances, three highly diverse art exhibitions, and plenty of fun and enjoyment for children and adults alike, not to mention a rich selection of culinary highlights, enhancing the value of White Turf as an all-round experience. To make all this possible, White Turf can rely on the special support of its two longstanding principal sponsors, Credit Suisse and BMW (Schweiz) AG, which actively set the social tone of the sports event. At the end of each race Sunday, the Prix d’Honneur, a free raffle, is drawn, allowing all holders of a programme brochure the chance to win dream trips, holidays in luxury hotels and other attractive prizes. With prize monies totalling more than CHF 400,000, White Turf is also the most lucrative equestrian event in Switzerland: The “Gübelin Grand Prix de St. Moritz”, for example, which counts as the European Cup on snow, is worth an impressive CHF 111,111 to the winner, making it the most highly prized race in Switzerland. WHITE TURF stands for sport of the highest calibre, featuring the most important horse race of the winter season. Inaugurated in 1985, the 26th St. Moritz Polo World Cup on Snow will take place between January 28 and 31, 2010. The tournament, formerly known by the title sponsor - Cartier - is now officially called the St. Moritz Polo World Cup on Snow. Although the new generic name ensures the longevity of the brand, the polo teams will once again be competing for the Cartier Trophy. Cartier is joined this year once again by Brioni and Bank Julius Baer (both have been sponsors for the past few years) and new to the tournament, the Italian sports car manufacturer, Maserati. As part of this highly original venture, Cartier commissioned the creation of special horseshoes that would offer the horses a better grip. The success of this event endorses Cartier’s enthusiasm for polo on snow – a sport that reflects a certain lifestyle for which Cartier remains a pioneer. Genuine jousting events on snowy terrains, these entertaining and exceptional fixtures have inspired Cartier to create a special anniversary trophy. Last year, for the 25th anniversary of the Cartier Polo World Cup on Snow in St Moritz, Cartier created the Maillet d’Or, a new trophy for which rival teams would compete each winter in the renowned ski resort. A fine example of jewellery craftsmanship, Cartier’s Maillet d’Or pays tribute to the vitality and elegance of polo through both the precious nature of its noble materials and the vigour of its powerful design. This prestigious trophy will fuel the passion of all enthusiasts of this exceptional sport. Last years winning team, Bank Julius Baer, led by George Milford Haven (Great Britain), will be defending its title against the three other participating teams, all of which play to a high goal handicap. 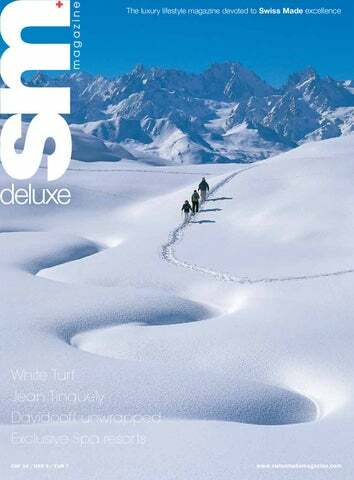 sm hotspots “A la carte” holidays in a luxury ski retreat All is set for an ideal holiday in Verbier, known as one of the best ski resorts in the world. The charm of a boutique hotel with five star service and limitless comfort in magnificent private residences: this is the signature of the Chalet Spa brand. Experience the supremely stylish side of Verbier, with Chalet Spa Verbier and Chalet Spa Blanche, two private residences benefitting from a five star service where contemporary design comes together with luxurious comfort like nowhere else. Elegant rooms, exceptional service, great spa areas, all very close to the ski lifts. Nestled at the base of Savoleyres, in the heart of Verbier, Chalet Spa residences combine perfect location and fine service with alpine cozy ambiance and breathtaking views. At Chalet Spa Verbier, the Spa invites guests to experience authentic spa therapy with soothing facials, massages, salon selections and Chalet Spa signature treatments. After a great ski day, the guests can relax in the outdoor Jacuzzi just outside the inner pool or enjoy a cocktail on the barbecue terrace in the hot tub nearby, with an incredible view on the Alps. The Hybris Mechanica à Grande Sonnerie, makes the dream of a holy grail of watchmaking a reality through the realization of the most complex and demanding form of horology. ters height and dubbed the ‘Infernal Tower’ by the watchmakers due to its complex construction. To prevent possible damage by inadvertently setting the time while in sonnerie mode, they created a jumping hour and minute mechanism, which is actually driven by the three-tiered tower thus eliminating any malfunction between timing and striking mechanism, and where the hours can be set forward only with a pusher at 2 o’clock. The rhythm and sound It is of vital importance that the striking rhythm of the hammers functions in a way that allows the gongs to develop their vibrations and deliver a full sonorous sound as well as correctly follow the rhythm of the melody. The evenness of this timing not only underlines the quality of mechanical virtue and purity of sound, it is a trademark of the very best repeater and Grande Sonnerie watches. Through an amazingly synchronized ballet of ratchets and especially developed gears, which can be observed through the open window in the dial, the engineers of the manufacture took great care to provide the listener with accurate, interruption-free melodies in every of the three sonnerie-modes, what is even more, the watch provides different sets of melodies, depending on the mode it is set to. Thirty sets of these three outstanding watches are due to be produced between 2009 and 2014 and will be delivered from September 2010 on. With an eye to long term wear Jaeger-LeCoultre’s watchmakers developed special titanium screws with a hexagonal head to supply additional sturdiness, as they provide five times more torque than standard screws, thus ensuring excellent security. The tourbillon and perpetual calendar Although the Grande Sonnerie alone is an outstanding piece of horological craftsmanship, this didn’t prevent the watchmakers of JaegerLeCoultre from adding two further complications. First is a tourbillon which they mounted onto the back of the movement. The specialists decided for a variant called a flying tourbillon. This, rather than supporting the tourbillon cage with a bridge at both the top and bottom, is cantilevered and thus held only at the underside. The whole mechanism, which consists of 73 parts, measures 12.42 millimeters in diameter and 3.85 in height. Furthermore the watchmakers in the Vallée de Joux took the additional challenge of incorporating a perpetual calendar mechanism to the movement with retrograde hands for all functions from date, month and weekday. A small leap year indicaton rounds off the calendar function. The mechanism is programmed until the year 2100, and in any case can be adjusted via push pieces hidden in the case between the lugs at 12 o’clock. The beautifully leather coated safe from a top German maker has a total weight of around 1200 kilograms, measuring 1 meter in width and 1.5 meters in height, will safeguard the precious watches if they are not worn. Underneath the sophisticated surface lie the most advanced security materials, easily able to fulfill all insurance requirements. Fitted with an electronic locking system, the safe is code-secured and has a built-in electronic winding machine for the three watches as well as eight further automatic winding systems for other timepieces. As the final icing on the cake, the manufacture installed a special, piezo-driven sound system in the safe, so that the actual chiming of the Hybris Mechanica à Grande Sonnerie can be heard from the outside even with the safe securely locked. BREITLING Chronomat B01 A powerful, unique and quintessential design, masterfully reinterpreted. A selfwinding chronograph movement entirely developed and crafted in the brand workshops. A stunning presence on the wrist distinguished by a blend of strength and elegance. Breitling has created a highly exclusive version of its leading Chronomat model, which is asserting itself more forcefully than ever as the benchmark in the field of mechanical chronographs. Equipped with the very first 100% in-house chronograph movement, the Chronomat B01 majestically heralds Breitling’s grand entrance into the selective circle of genuine watch movement manufacturers. Designed to guarantee maximum precision, reliability and functionality, it represents the culmination of the long-running quest for performance characteristic of Breitling “instruments for professionals”. The unidirectional rotating bezel – an essential companion in measuring flight or dive times – is adorned with exclusive engraved numerals ensuring excellent readability while endowing the chronograph with an eminently recognizable face. Crafted with extreme concern for details, this flagship luxury model is bound to delight devotees of fine timepieces born to accomplish great feats. Chronomat B01: the ultimate chronograph with a perfect fuselage. F.P. JOURNE Chronomètre Bleu The new creation by F.P. Journe is innovative with its 39 mm case made for the first time of Tantalum, a rare dark grey metal with blue overtones. Tantalum is a wonderful metal but rarely used in watchmaking as it is hard and very difficult to manipulate, due to its very high fusion temperature of 3000° and a density of 16.3. Tantalum is also precious as it is highly resistant to corrosion and wear. The chrome blue dial is in perfect harmony with the colour of the case in a contemporary spirit. The F.P.Journe hands, matching the large cream-coloured Arabic numerals, mark the hours while the guilloché seconds dial at 7:30 enhances the mirror effect of the main dial. The manual winding movement of the CHRONOMETRE BLEU is made in 18K rose gold, like that of all F.P.Journe creations. Signed with the label ­Invenit et Fecit- (invented and made), each F.P.Journe exclusive movement guarantees a manufacture calibre, invented, constructed, and assembled entirely in our Geneva workshops. For the CHRONOMETRE BLEU, the exacting motto of F.P.Journe’s watchmakers holds true: “to each watchmaker his own watch”. Through the transparent back, the balance and escapement appear to be mysteriously detached from the movement, beating with no apparent motive force. F.P.Journe has placed the connecting train under the dial, leaving only the centre wheel to highlight the isolation of the balance. CHOPARD L.U.C. Chrono ONE With its sleek, strong lines, contemporary look and a thoroughbred in its class, the L.U.C Chrono One chronograph represents an ideal blend of refined technical and aesthetic features. Housing a movement entirely designed, developed and produced in-house, this new chronograph offering a flyback function features several major innovations for which three patents have been filed. This exceptional watch beats to the cadence of the L.U.C 11 CF movement, chronometer-certified by the COSC. The exceptional quality standards applied to this L.U.C Chrono One are reflected in the incomparable lines of its design. Crafted in polished and brushed steel, the 42 mm case features an admirable blend of classical elegance and dynamic sportsmanship. The brilliant black dial is a model of clarity, particularly with its two oversized hour and minute counters slightly offset from the crown axis. The slender, partially hollowed â&#x20AC;&#x153;Techâ&#x20AC;?-style hour and minute hands are coated in Superluminova to ensure optimal nighttime readability. With a water-resistance level to 30 metres and endowed with a 60-hour power reserve, this chronograph is equipped with a sapphire glass and transparent case back revealing the movement. The meticulous finishing of the case and dial is matched by an exceptional movement. Designed, developed and produced by Chopard Manufacture, the L.U.C Calibre 11 CF is an integrated chronograph movement. AUDERMARS PIGUET Millenary Carbon One The Millenary Carbon One has emerged straight from Audemars Piguetâ&#x20AC;&#x2122;s cutting-edge research laboratory. This special development unit combines the finest talents â&#x20AC;&#x201C; engineers, designers and watchmakers. Its mission consists in exploring advanced technical paths in order to ensure 100% in-house conception, prototype creation and production of exclusive movements that are a perfect match for their exterior. The Millenary Carbon One, a limited series of 120 watches, has just emerged from this hotbed of creativity. It is freely inspired by motor sports and their extraordinary ultra-light high-performance speed machines, while adopting the oval shape of the Millenary as a spectacular playground. Its key strengths include a threedimensional design, innovative materials, and a 100% proprietary movement equipped with a tourbillon, a chronograph and a 10-day power reserve. The Millenary Carbon One is intended for connoisseurs of Haute Horlogerie with a decided taste for fine mechanical engineering and who like to remain in the forefront of design, at the exact place where the exterior and the movement meet and merge, and where aesthetic and technical factors blend into a unified whole. OMEGA Seamaster Planet Ocean Liquidmetal® The Omega Seamaster Planet Ocean Liquidmetal® Limited Edition is the world’s first watch to bond ceramics and Liquidmetal® . The Liquidmetal® alloy is an amorphous metal – a metallic material with a disordered, non-crystalline atomic structure. Its fusion temperature is half that of conventional titanium alloys but when it is cooled, its hardness is three times as great as that of stainless steel. Its amorphous structure allows it to bond seamlessly with the ceramic bezel. The Liquidmetal® is a bulk metallic glass alloy consisting of five elements: zirconium, titanium, copper, nickel and beryllium. A bulk metallic glass can, by virtue of its low critical cooling rate, be formed into a structure with a thickness of more than a tenth of a millimetre. Zirconium is an important constituent part both of the Liquidmetal® alloy and of the ceramic material which is made of zirconium dioxide (Zr02). The perfectly smooth bezel is particularly resistant to scratching and corrosion because of the hardness of the two components. A design which will retain its appearance indefinitely. The OMEGA Seamaster Planet Ocean Liquidmetal® Limited Edition, which has a stainless steel case and bracelet, is driven by OMEGA’s revolutionary Co-Axial calibre 2500. The remarkable world premiere is being launched in a limited edition of 1948 pieces in honour of the year OMEGA launched its popular Seamaster watch line. past century. But today a new imperative – driven by economic and environmental concerns – has forced us to begin developing a new type of automotive propulsion to supplement and eventually supplant the internal combustion engine in order to reduce our dependence on polluting and diminishing supplies of oil. Like the first automobiles, the initial prototypes for electric vehicles – even those that made it to market – remained on the fringe. Sacrifices in such sought-after qualities as luxury, performance and prestige were made towards the vehicle’s main purpose. But like the original automobiles, electric vehicles will continue to merge into the mainstream until they become commonplace. The trend has already begun to bear fruit, and a new generation of exciting, yet environmentally-conscious vehicles has arisen to simultaneously hug the road, pamper the driver and embrace the planet. And while the established industry giants may be in the best position to present these new vehicles to the motoring public, a new crop of independent automakers has begun to sprout, bearing the fruit of progress, among them several that are bringing the automobile back to its roots in Switzerland for replanting. a new generation of exciting, yet environmentally-conscious vehicles has arisen Although diminishing in their prominence, the major international automobile expositions remain one of the most important showcases of human mobility. And while nearly every significant motor show around the world over the past several years has endeavored to promote the “green” automobile, arguably nowhere was this more evident than the recently concluded international auto show in Frankfurt. There three of Germany’s largest automakers showcased their latest designs for exclusive, high-performance exotic sportscars. But each had a surprisingly earthfriendly twist, and each in a radically different way. Mercedes-Benz came to Frankfurt with an exotic, range-topping supercar of its own that will likewise offer electric-only motivation. After years of collaboration with its Formula One racing partner on the SLR McLaren supercar, Mercedes has gone its own way with the new SLS AMG. Developed entirely inhouse, the SLS is characterized by its retro styling and gull-wing doors reminiscent of the classic 300SL of yore. And while its 6.2-liter, 560hp V8 may not be the cleanest-burning engine on the market, Mercedes has announced that it is developing an entirely electric powertrain for the top-of-the-line supercar that will also be available to the public in the near future. Meanwhile BMW came to Frankfurt with the Vision EfficientDynamics show car. Incorporating a miniscule 1.5-liter three-cylinder turbodiesel engine coupled to a pair of electric motors, the Vision EfficientDynamics is a rolling showcase of what a hybrid sportscar can offer in terms of driving performance with a minimal impact to the environment through which itâ&#x20AC;&#x2122;s propelled. Although just a concept car for the time being, industry sources indicate that BMW is working on a production version that will demonstrate its parallel commitments to performance and the environment. These are only a few of the most exciting new environmentally-friendly performance automobiles coming to market in the near future. Automakers like these and others are already offering a growing variety of hybrid luxury vehicles in markets around the world. But as incremental as these changes are to the modern automobile, theyâ&#x20AC;&#x2122;re being lead by a small group of independent start-ups driving the public conscience and their mainstream colleagues along with them. California-based Tesla Motors was among the first, bridging the gap between Detroit and Silicon Valley with its all-electric Roadster. Based on a lightweight, compact chassis engineered by Lotus, the Tesla Roadster took the industry by storm. Following years of development, the Roadster is now available on the market for public consumption, and its creators are moving on to the next project, an innovative electric luxury sedan tentatively known as the Model S.
Joining Tesla on the stage for the first dedicated exclusive electric automobiles is the start-up headed by legendary automotive designer Henrik Fisker. After penning such noteworthy shapes as the Aston Martin DB9 and BMW Z8, and establishing his own coachbuilding operation to re-body BMW and MercedesBenz sportscars as even more desirable objects of rolling art, Fisker unveiled plans for the Karma. Powered by the Quantum plug-in hybrid drive coupled to a 2-liter engine furnished by General Motors, the Karma saloon is joined by the equally sumptuous Sunset convertible. With curvaceous bodywork and environmentally-friendly propulsion, the Fisker Karma and Sunset will offer buyers in the market for an exclusive, luxurious automobile little excuse but to join the cause and lead the industry to greener pastures. With independent companies like Tesla and Fisker taking the initiative in a transforming automobile industry, a number of Swiss companies have joined the scene with a new generation of innovation of their own. Jean Tinguely was an extremely prolific Swiss artist who spent his life creating kinetic sculpture as part of the Parisian avant-garde movement. He was born on May 22, 1925 in Fribourg, Switzerland. That same year, he and his mother moved to Basel, where Tinguely would attend school. In 1941, at the age of 16, he began an apprenticeship as a decorator. Upon finishing his apprenticeship in 1944, he then went on to attend the School of Arts and Crafts in Basel. A few years later, he became interested in the ideas of anarchy in the circle of Heiner Koechlin. In 1951, Tinguely married fellow sculptor Eva Aeppli. The following year, the couple moved to France, a move that would significantly influence Tinguely’s art career. Only two years later, his first exhibition opened at Galerie Arnaud in Paris. Tinguely’s work and genius has been widely recognized in the art world. various works since 1960. For the next two decades, he focused on his own personal projects while also undertaking countless commissions for public works. This includes the “Fontaine Jo Siffert”, a gift given to the city of Fribourg in 1984, and the “Fontaine de Château-Chinon,” a fountain that was commissioned by the President of France and co-designed with his wife, Niki de Saint Phalle. Towards the end of his life and career, Jean Tinguely began working with skull sculptures. He first exhibited these at the Abbey of Sénanque in 1981, and he continued to work with them, even including animal skulls in his 1986 work, “Mengele-Totentanz,” which was also composed of charred beams and burnt agricultural machinery that was found in an old, burned farmhouse. Tinguely’s work and genius has been widely recognized in the art world. During his life, he was given retrospectives at the Tate Gallery in London, the Palais des Beaux-Arts in Brussels, the Musée d’Art et d’Histoire in Geneva and the Kunsthaus in Zurich. After his death in 1991, many tributes emerged for him. One example is the Tinguely Museum, which opened in Basel, Tinguely’s home town, in 1996, entirely financed by the Healthcare company Roche. Zino Davidoff, one of the founders of the Davidoff empire, was a world traveler. When he was young, he left the safety of Geneva, Switzerland to discover the world. When Zino Davidoff SA decided to reintegrate the Licenses and relaunch itself the luxury accessories – watches, pens and leather goods - in 2008, it was only natural that they have a travel theme. Schaffner calls “introverted luxury.” “Our products are not screaming luxury -- we go for things that are meant to stay,” Schaffner says. “Our watches have classic values with contemporary elements, and still some chic, because classic doesn’t need to be old man’s style.” The shape most closely associated with Zino Davidoff is the oval, which can be found in a great number of Davidoff products. Even the logo for Davidoff is a stylized, oval ‘double D’ for Davidoff. Traveling played such a big role in the life of Zino and it is a huge part of the company’s heritage – for example, if you look at old maps, they always have two hemispheres, so the logo represents the world of Davidoff. This is very conceptual, certainly, but it makes sense for the brand. The watch collection, called Very Zino, uses this oval shape for the cases, which is very unique in the watch industry. Indicative of how Davidoff approaches all its products, the attempt is to distinguish Davidoff watches, pens and leather goods, without being “in your face” with design. century of history and drew from it an ever so slightly more mature, sedated response in the form of the Galibier 16C. Unveiled at the company’s Château St. Jean headquarters in Molsheim, France, to an exclusive cadre of clients and reporters in advance of this year’s Frankfurt Auto Show, the Bugatti Galibier 16C is a shining example of excellence in versatility – at least in relation to its predecessor. Succeeding the midengine, two-door body-style of the Veyron, the Galibier showcases the epitome of the luxury four-door saloon. Its engine is derived from the same program that gave birth to its precursor, only slightly detuned 800 horsepower in output – a figure which pales only in comparison to the Veyron’s, but still surpasses any rival by order of magnitude. Its name is derived from the precarious Alpine road through which the Tour de France passes, and pays homage to the original four-door Bugatti Type 57 that bore the same name over seventy years ago. As Bugatti passes the 100-year milestone and replaces the Veyron with the Galibier, it once again turned to Parmigiani Fleurier for an encore performance of the excellence it demonstrated with the Type 370. This time, Parmigiani crafted a tourbillon mechanism, a shining example of the most intricate and sought-after of watch movements ever devised, wherein the entire mechanism rotates inside the case, originally designed to counteract the effects of gravity on a mechanism’s precision over time. But as could be expected from a workshop as creative as Parmigiani, the Bugatti Tourbillon doesn’t stop there. Instead, the Swiss firm went one step further to integrate the watch into the car itself and echo the Galibier’s versatility. Joining the four wheels, four doors, four seats, four cylinder banks and four turbochargers that characterize the Galibier, Parmigiani’s tourbillon has four uses: it can be worn on the wrist or in the pocket, docked into the car’s dashboard or mounted into a desktop winding display. Whereas the Veyron and the Type 370 were mechanical marvels to be used on select occasions, Bugatti and Parmigiani designed the Galibier and the accompanying Tourbillon to go with their owner wherever the road takes them. It’s an approach that reflects perspective born of time, harnessing the same mechanical precision and engineering excellence that has motivated Bugatti for a hundred years to propel the marque – and with it, its partners – forward for another century to come. Whatever their inspiration, Piaget Haute Joaillerie creations express a singleminded vocation based on expertise and a love of fresh challenges, as well as boundless creativity and the determination to “always do better than necessary”. The brandmotto is once again illustrated through this array of fairytale models testifying to the talent and genius of its dedicated artisans. cut diamonds. Once closed, the watch returns to its role as a full-fledge piece of jewellery in its own right. 870 hours of intricate workmanship and 200 hours of gem-setting were required to achieve the incredibly bold final result of a piece that is truly amazing both in terms of its design and its execution called for almost. Dexterity, visual acuity and experience combine to provide each gemstone with the setting that will best highlight its radiance. After thousands of hours of patient, skilled craftsmanship lavished on them by the goldsmiths and gem-setters, the Piaget jewellery dreams spring to vibrant life. While the design of these four Haute Joaillerie creations testifies to the variety of inspiration and the creative independence of the Maison, the techniques employed have followed the same complex path over the past 50 years, entirely dedicated to the relentless pursuit of perfection. CHOPARD Happy Spirit For those who prefer snowy summits and the ethereal whiteness of a winter landscape, the famous Happy Diamonds jewellery collection has now transformed into Happy Hearts. Pendants and earrings of small white gold hearts, with or without a setting, accentuate a face or a neckline. Bertolucci’s Haute Couture is a luxurious, daring combination, revealing the jeweler’s expertise in prestigious pieces crafted entirely by hand with the most precious of materials. Structured and startling, GIOCO was born as a result of the perfect alliance between the traditional high-end jewellery and the candid interpretation of feminine fantasy. It marries without inhibition a timeless style with a refined extravagance to become an astounding piece of true luxury. Bertolucci’s GIOCO celebrates the hypnotic beauty of women, whose unique appearance illuminates the evenings and captures the entire attention. Dedicated to adorn the wrist of the most elegant and discerning woman, each model is created in a limited edition of only five pieces. True objects reflecting the art of bespoken jewellery, entirely crafted by hand, both the GIOCO pieces emphasize the mystery of seduction with such a pure dial, which seemingly slides indefinitely into a swirling abyss of 18 carat gold. Once again, Bertolucci draws upon the arts of watchmaking and jewellery with an unchallenged craftsmanship to achieve a true work of high-end jewellery. An innovative and complex construction gives life to a bezel made of 6 different elements, set one by one and assembled by hand on the dial. A totally new and daring architecture for a watch with a unique charisma. GIOCO glitters in white gold combined with its case, dial and buckle adorned with 527 full cut diamonds, which sparkle amidst the enlightened evenings. Often called the world’s most beautiful woman, Aishwarya Rai Bachchan has been a Longines Ambassador of Elegance for 10 years. he award-winning Indian actress, model and former Miss World shares a love of excellence, elegance and beauty with the Swiss luxury watch brand. era does the same. The scene finishes with a flurry, and a breathless Bachchan collapses on a sofa. Then she grins, turns to the camera and murmurs, “You make my head spin.” The glamorous and accomplished Bachchan is an ideal spokeswoman for the new Longines timepiece. Soft and yet strong, the mysterious PrimaLuna emerges from the night into a wakening world. The moon is no longer pale but iridescent, opaline and masterful. The exquisite purity of the dial enhances the PrimaLuna’s silhouette, and sparkling diamonds add to the magnificence the face. Graceful and magical, this watch will seduce women who appreciate contemporary, sophisticated elegance. The PrimaLuna collection offers several options: stainless steel, the rich hue of rose or yellow gold, a blend of rose gold and steel, or a leather strap. Choose from a selection of heavenly dials: white, silvered or mother-of-pearl decorated with hour symbols, Arabic or Roman numerals or diamonds. Three hands — blued, gilded or rose — mark the passing of time. As multifaceted as the modern woman, the PrimaLuna range comes in four sizes. This watch is also a piece of jewelry. The pleasing curves of the case are embellished by a play of diamonds, and pieces of pure carbon glitter with fascination. Similarly, the white mother-of-pearl dials of the most sophisticated models also sport sparkling teardrops that will appeal to any woman who loves diamonds. Ah, what a little moonlight can do! Be part of a Splendide experience. Enjoy the elegance, discrete luxury and magic atmosphere of the Hotel Splendide Royal. In our historic palace, you will experience the tradition of hospitality and fine dining that has been valued by royal families, celebrities and famous artists from all over the world. In our restaurant, you will savor the local flavors of our contemporary Italian cuisine. and celebrities such as Elizabeth Taylor and Sharon Stone, Macy’s Passport works closely with the community, which is the heartbeat of this beloved production. “According to the CDC, every 9 ½ minutes someone in the United States becomes infected with HIV. Therefore we need a collective response that meets the severity of the pandemic head-on, and reaches all populations at risk by supporting research, care, prevention and education programs,” says Terry J. Lundgren, Macy’s chairman, president and CEO. “Macy’s understands the heartbreak and devastation caused by HIV/AIDS and we have taken a leadership role in this worthwhile cause for more than a quarter century.” Responding to the pandemic that is HIV/AIDS Macy’s Passport carefully selects beneficiaries and opens its doors to present a special night for 2,100 teens called Fashion Inform. Headlining beneficiaries include: AIDS Emergency Fund, which provides financial assistance to people with HIV to help stabilize their living situations; Glide Memorial Church with provides a comprehensive range of supportive and preventative programs; and Project Open Hand, which provides meals and groceries to homebound people living with HIV/AIDS. Fashion Inform Teen Night beneficiaries are Huckleberry Youth Programs which provides HIV education, shelter, job readiness training, leadership development to runaway and at-risk youth; New Conservatory Theatre, which gives an artistic voice to the LGBT community educating thousands on critical wellness issues through its landmark YouthAware series; and the School Health Programs Department, which addresses the health needs of school children and their families. Some of the companies featured at DPA gift suites in the past are Chopard, Jaeger Le Coultre, Nespresso, Rene Caovilla, Pucci, Fendi, Robert Wan, Rene Furterer, Falke, Spatika and KoGenDo. One Swiss brand Dubois helped launch on the American market is watchmaker Aquanautic, which gave diamond timepieces to Katherine Heigl, Eva Longoria, Paula Abdul, Nicollette Sheridan and Michael Madsen, among others. But the who’s who of show business has visited Dubois’ suites all over the world, from Catherine Deneuve to Sting, Scarlett Johannson and Stefania Rocca, just to name a few. Nestled in a magnificent Alpine landscape, Gstaad is part of the Saanenland located in south western Switzerland, bordering on the Frenchspeaking part of the country. No other holiday region spoils its guests’ palates like Gstaad does. More than 100 restaurants ranging from a cosy raclette restaurant to a gourmet restaurant are available to choose from. The renowned Gault Millau restaurant guide recently awarded 13 chefs from the region a total of 191 points. The Alpine businesses also offer various accommodation options. With less than 12,000 inhabitants, the holiday destination of Gstaad has an offering of cultural and sporting events which would be extraordinary even for urban regions. Every year, guests can choose from more than 1,000 different events. Some of these events have a top international format, such as the Menuhin Festival or the Allianz Suisse Open tennis tournament – to name but a few. All things considered, Gstaad can be considered a paradise for people who think that enjoyment and wellbeing is more important than ‘ticking off as many new attractions as possible’. The region has and conveys to its guests a stylish and cultured attitude to life. The combination of the special experiences for which Gstaad is so famous is unrivalled. It cannot be found anywhere else and makes Gstaad the ‘last paradise in a crazy world’ (quote by Julie Andrews, a regular visitor to Gstaad). The region can be reached easily by train or car from the Lake Thun region, the Lake Geneva area and the Gruyère area. The view of the snow-capped Bern, Fribourg and Vaud Alps as well as the Gelten and Diablerets Glaciers are a mountain lover’s paradise! Interested in ultimate igloo luxury? Spend a night in the most exclusive igloo with private whirlpool. starting at CHF 470.- (EUR 309.-) up to CHF 630.- (EUR 429.-) if you decide to take your lover here to spend a memorable New Year’s Eve. The Igloo Villages also offer overnight accommodation in Standard Igloos, which have space for six people. Stays in the Igloo Villages are available in Gstaad, Davos, Engelberg and Zermatt from December 31st, 2009 until April 10, 2010. Each location has a different wellness-offer and not every location has every room-type. If you fancy taking a group of friends along or gather a private party or company clients to a unique experience, you can even rent an entire Igloo Village for a night including apéritif, evening meal, whirlpool/sauna, breakfast and a snowshoe hike. The Igloo Bar at the Snow Palace is the perfect place to go whether you would like to enjoy an après-ski drink, to rest after a hiking trek or just a quick stop between ski runs. A visit to the bar is a pleasure to all senses which should not be missed! Funky music, brilliant service from our ‘bar Inuits’ and a good selection of snacks and munchies make the Igloo Bar an unforgettable experience. As we all know, the food of the “Alpine Inuit” is cheese fondue! You can enjoy delicious cheese fondue in an unparalleled atmosphere inside the igloo or on the snow terrace. Whether it is your daytime meal between ski runs or in the evening by candlelight – it is all up to you. Build a classic igloo block by block with your boyfriend, girlfriend, family, friends, or co-workers! Or how about building several of them all at once? Experience the highlight of putting the last block into a snow house! Saas-Fee, the Pearl of the Alps, is situated amidst the highest mountains in Switzerland. Let the magic of the Saas-Valley cast its spell on you. n winter the high-altitude valley benefits from its elevation and enjoys guaranteed snow. Apart from being able to ski up to an altitude of 3600 m above sea-level, visitors also benefit from a wide variety of shops and entertainment. Whether you want to indulge in a little après-ski or enjoy a gentle stroll, whether you want to join in a game of curling or a night-time sledding run, there is every kind of entertainment in the Saas Valley! Majestic four-thousand-metre peaks, glaciers so close you could almost touch them, a deep blue sky: that’s the Saas Valley. Discover the unique world of mountains which fascinates visitors in both summer and winter. The four villages in the Saas Valley have a wide variety of activities for tourists all year round. Saas-Fee lies in an idyllic valley surrounded by the highest mountains in the Swiss Alps. No less than 13 four-thousandmetre peaks encircle our village at the foot of the glaciers like a shell and give it its distinctive name “the Pearl of the Alps”. Let yourself fall under its spell and enjoy your holiday in the fresh, clean alpine air because there are no cars in the village. Saas-Grund is the village at the heart of the Saas Valley and offers a wide variety of activities for tourists. It is the ideal starting place for undertaking the legendary high-altitude Saas trails. From Hohsaas (3100 m above sea-level) you can enjoy a breathtaking view of all 18 four-thousand-metre peaks which surround the area - a real highlight of your holiday. Saas-Almagell, the home village of the Olympic champion Pirmin Zurbriggen is the most southerly village in the Saas Valley. The natural dam at Mattmark is a top tourist attraction. Saas-Almagell is a friendly, family-oriented village which has retained the character of a typical Valais mountain village to the present day. Saas-Balen, a refuge for rest and relaxation. You can see an enormous variety of alpine flowers at Heimischgartu (2100 m above sea-level) and by the milky Grüebe lake. Well worth seeing is the late-baroque round church, a building of national importance, and the roaring Fellbach stream which runs through the middle of the village. The unforgettable trip to our high-Alpine wonderland of eternal ice and snow is the true “highlight” of a visit to Switzerland. At an amazing 3454 metres, this is Europe’s highest-altitude railway station. he JUNGFRAU REGION south of Interlaken is the rather uninspiring title foisted on what is perhaps the most dramatic, certainly the most memorable, mountain scenery in the whole of Switzerland. The Matterhorn may be more recognizable, Davos and St Moritz may be flashier, but the quantity and sheer scale of the awesome giants on offer here at close quarters takes your breath away. The area is dominated by the mighty triple crest of the Eiger, Mönch and Jungfrau (Ogre, Monk and Virgin) – three giant peaks rising side-by-side to 4000m and seemingly always mentioned in the same breath. The Jungfrau is the focus, partly because it’s the highest (at 4158m), and partly because the network of mountain trains from Interlaken Ost culminates at the Jungfraujoch, a saddle below the Jungfrau peak that claims the honour of being the site of the highest train station in Europe. The ride up to the summit – dubbed the “Top of Europe” – is touted endlessly in Interlaken and beyond as being the highlight of a Swiss visit and, despite the hype, it’s not far wrong. However, plenty of equally stunning scenery is also to be had at lower altitudes. The region is focused on two valleys, which divide a few kilometres south of Interlaken. To the west is the famous Lauterbrunnen valley, celebrated with justification as the loveliest mountain valley in Europe, with its alluring resorts of Wengen and Mürren. To the east, the narrow Lütschen valley widens out on its way to the bustling town of Grindelwald, perfectly placed for its many visitors to take advantage of the hiking and skiing possibilities all around. Excellent transport around all these places – mostly trains, but also taking in cable-cars, funiculars and the odd bus – means that you can roam to your heart’s content, which, with the quality of natural scenery on offer, may take a while. Mountain trains throughout the Jungfrau region are operated by the Jungfraubahnen (033/828 71 11, www.jungfraubahn.ch). They have a Jungfraubahnen Pass, valid for free travel on their entire network apart from the Kleine Scheidegg–Jungfraujoch section (on which passholders travel for half the full fare). The pass, valid for five consecutive days, costs Fr.133, or Fr.85 to holders of the Swiss Half-Fare Card. Eurailers get a 25 percent discount on all Jungfraubahnen trains, except where mentioned in the guide text. Swiss Pass holders get free travel on trains to Mürren, Wengen and Grindelwald, and a 25 percent discount on journeys higher up. InterRail brings no discount at all, apart from on the few occasions mentioned in the guide text. First Flyer The First Flyer (originated in the USA where it is known as a Zip Rider) gives four people the chance to simultaneously yet independently glide through the air on a length of cable about 800 metres long, at speeds of up to 84km/h. In effect the construction is four parallel Tyroliennes, which link the starting and finishing platforms without supporting masts. Guests sit in a special harness which is very similar to that used for paragliding. The harness is attached to a safe roller mechanism. The facility is just as suitable for use in winter as in summer and makes a spectacular addition to the other mountain activities on offer. The First Flyer is suitable for people of all ages: it will fascinate children and adults and the fact that four people can use the First Flyer at the same time highlights the attraction as a family and group experience. The dream of swishing through the air becomes reality with the First Flyer; particularly as the high speed and maximum height of 45 metres above ground create a high-flying feeling! This kind of facility is currently found only in the USA (Park City, Snowbird, Utah Olympic Park, Icy Strait Point, Wildcat and Heavenly Valley) and in Siberia (Krasnojarsk). The facility at GrindelwaldFirst is thus the first of its kind in Europe. With the recently opened Tschuggen Bergoase designed by the Swiss star architect Mario Botta, the Tschuggen Grand Hotel has not only created an unmistakeable visual landmark, but also redefined the much-used term “Wellness”. With the greatest possible well-being of its guests in mind, visions have been turned into reality in this unique building – especially in terms of architecture and interior design. Waiting for the ski bus? Queuing at the lift? Not any more. “Time is luxury” – this saying also applies to the traditional winter holidays, in which the daily journey from hotel to the long awaited first downhill descent can sometimes take up to an hour. Waiting for the ski bus in the freezing cold or standing around in uncomfortable ski boots for the cable car – that’s passé for guests of the Tschuggen Grand Hotel this winter. Winter holiday visitors can be on the slopes in less than 2½ minutes each morning thanks to the new Tschuggen Express. The only one of its kind in the Alps, this futuristic mountain railway – exclusively for the use of hotel guests – begins on 27 November its first full winter season, which runs until mid April 2010. The Tschuggen Express successfully completed its final winter test begun in February 2009, and in the summer, it brought hiking guests to the summit. And now the management and staff of the five-star establishment are keenly anticipating the official start to the first full winter season for the hotel’s own rail taxi. At the touch of a button, the two cabins of the Tschuggen Express take 12 hotel guests directly to the skiing area each trip. While guests enjoy the view over the snow-clad mountain peaks from the comfort of their leather seats, the train gains 150 metres in altitude over a stretch of 528 metres of track. The maximum incline is 52 per cent. The Tschuggen Express travels at a speed of 4 metres per second, allowing the journey to be completed in less than two and a half minutes. teristic furniture, imaginative accessories and large, luxurious bathrooms create a modern experience of well-being with an incomparable view of the Arosa mountain scenery. Gastronomic diversity is provided by the five in-house restaurants which have committed themselves to down-to-earth cuisine – whether for a gala dinner or a raclette evening. Great importance is attached to fresh produce, herbs and mouth-watering flavours, prepared in unusual and individual styles and with a new unpretentiousness. The “La Vetta” gourmet restaurant was included in the GaultMillau 2007 guide with 14 points at the first attempt. In response to the enormous success, the Tschuggen Grand Hotel opens for ten months from June until April since 2008. The mild and agreeable mountain summer in the Alps makes it a perfect location for hiking, mountain-biking, Nordic walking or golf on the highest 18-hole golf-course in Europe at an altitude of 2000 metres. Tradition and MODERNITY The world of watchmaking celebrates today the return to the values of the past and the tradition. EBERHARD & CO Tazio Nuvolari Edition Limité Grand Prix Inspired by a myth of motor sport, Tazio Nuvolari, described as “the greatest driver of the past, present and future”. The exclusive chronograph, produced in a limited edition of 999 pieces, retains the distinctive characteristics of the previous “Tazio Nuvolari” model, created and produced with a deliberate philosophy, based on the instrumentation of the vintage racing car. The driver’s seat of the extraordinary vehicles, in which the much celebrated driver achieved many victories, was in fact one of the sources that inspired Eberhard’s technicians, both on the aesthetic and functional levels. The instruments located on the car dashboard reflected the demands of essentialness, distinctness, ease of reading, precision, weatherproofing and shock resistance, and all these indispensible requirements are also featured in the new edition of the watch. “Tazio Nuvolari Edition Limitée Grand Prix TN” becomes synonymous with passion, strength and speed, all fundamental characteristics of the essence of sports racing and its long and deep-rooted tradition. Breguet’s Marine Royale 5847 comes with an alarm device that can only delight both amateur divers and aficionados of exceptional complications. Underwater tests confirm that sound travels better through water than through air. With the new Torpedo Historiador Semanal (“Weekly Historian Torpedo”), Cuervo y Sobrinos brings to life again one of their most emblematic historic models. This watch is a revival on a modern note of the Cuervo y Sobrinos dating back to the 40s. The original mechanism was created and subsequently patented in 1944 by a Fontainemelon manufacturer of Swiss movements. Cuervo y Sobrinos was using this original movement during many years between 1945 and 1955. The Swiss Watch manufacturer decided to reproduce this calibre, creating their own module to enhance the original product. Two years’ research was devoted to developing this model and the result was well worth the effort. Steel back with dodecagonal case in CENTURY black sapphire with 12 facets cut and polished by hand. Black dial with red oversized 8. Self-winding mechanical movement, COSC-certified chronometer. Black canvas strap with deployment clasp. Sound waves require material support and their speed increases with the density of the environment. Sound travels about four times faster under than above water. Furthermore, as the underwater milieu is generally far less noisy than the aerial one, the alarm’s sound is perceived with greater clarity underwater. “LUVORENE”: an unusual yet charming name, an anagram of “Révolune” thought up by Vincent Bérard, a combination of the French words “rêve”, “lune” and “révolution” – dream, moon, revolution. The Tissot Couturier watches express their madeto-measure character through a selection of five different movements. There are two Tissot Couturier Chrono Auto models, one powered by the celebrated 7750 Valjoux movement, the other by a newly developed ETA C01.211 mechanism. In these timepieces, the attention to detail is evident in small, finely marked, round chronograph counters, mirrored by a circular white date display. The Tissot Couturier Gent Auto turns heads with its symmetrical design, which is underlined by a two-part, arc-shaped date display at 12 o’clock and 6 o’clock. The Tissot Couturier Gent Quartz is a three-hand timepiece that seduces with its simplicity. Its counterpart is the Tissot Chrono Quartz with larger counters and a rectangular date window. The new “LUVORENE 2” range is presented in a wider, 45 mm casing, and with transparent-sapphire blue faces which reveal the exquisiteness of the mechanism and of the “mysterious” balance, arranged offset at 3 o’clock. The unique aesthetics of the exclusive VB 441 mechanism by Vincent Bérard with its plate and spindle-shaped bridges, arranged in five stages, manually adorned, are revealed when you open the lid of the transparent bottom of the casing. Fine watchmaking enthusiasts will appreciate the complexity of the movement, which comprises 125 components, and delight in the exceptional new case which, with its 48 components, is a veritable feat of virtuosity. “A real boy always has a pocket knife along.” And if he’s lucky, it’s an Original Swiss Army Knife, not so much a possession as it is a faithful friend. Through its subsidiaries and partners, Victorinox is today represented all over the world. The worldwide sales organization includes brand stores in Tokyo, New York and Paris as well as the first Flagship Store in London and a newly opened Flagship store in Geneva. The beginning With the support of his mother, Victoria, Karl Elsener founded his cutlery workshop in Schwyz, Switzerland, in 1884. In the 19th century, Switzerland was a poor country, and unemployment forced many citizens to emigrate. Confronted with this situation, Elsener sought to create jobs. However, because he did not want to build a factory at this time, he founded the Swiss Cutlers’ Association, with the goal of cooperating to produce within Switzerland the knives for Swiss Army soldiers. The first delivery to the Army was made in 1891. Somewhat later, Elsener developed the Original Swiss Army Knife. This was lighter and more elegant than the official soldier’s knife and included six practical tools. After his mother died in 1909, Elsener introduced the brand name Victoria in her honor. That same year, he registered the distinctive emblem with the cross and shield as a trademark. It is now a registered trademark in more than 120 countries. In 1921, the invention of stainless steel was of central importance to the cutlery industry. To reflect this development, Elsener coined the company’s new name, Victorinox, by combining his mother’s name with “inox,” which is derived from the French word “inoxydable” (stainless). Today, the Swiss Army Knife is offered in more than 100 variations and combinations. Among the more notable developments in this collection are the top models: the Swiss Champ with 33 functions, the SwissFlash USB pocket knife with up to 16GB storage capacity, the pocket knife with the smallest laser pointer in the world and a prize possession in the rescue and security services, the Victorinox Rescue Tool. Victorinox also produces cutlery for use by home cooks or professional chefs and butchers. Ergonomics and ease of handling are the underlying criteria for this range of products — and, of course, the high quality for which Victorinox is known. Victorinox Swiss Army timepieces The Victorinox brand began to expand with a fusion of the Victorinox watchmaking business and other Victorinox products. The brand Swiss Army was a creation of the American partner of Victorinox in 1989, which successfully launched the first watch collection under this brand name. All Victorinox watches are manufactured in the company’s own facilities in the heart of the Swiss watchmaking region in Canton Jura. Each timepiece has its own style, but all share the characteristics of every Victorinox product: sturdiness, superior technology, inventive design and high quality. Victorinox Swiss Army timepieces are divided into three segments. “Active” watches appeal to dynamic people with a modern, active lifestyle. The “Classic” line fulfills the demand for sporting, luxury-oriented watches. Last but not least, the “Professional” collection melds refined functions with technically excellent movements. To celebrate its jubilee, Victorinox has created the Infantry Vintage Limited Edition watch. This 1940s design is carried out in a rich red and gold dial decoration, with an engraved anniversary seal and inscription on the back. Limited to 125 pieces, it is sure to become a cult object. Victorinox Fragrances The Victorinox Fragrances evoke the elements of nature and the breathtaking beauty of the Swiss mountains. The art of composing a fragrance lies in creating a unique fragrant touch from a wealth of possibilities. In both of the Victorinox Fragrance families, Victorinox Swiss Unlimited and Swiss Army, the perfume designers at Victorinox have succeeded in expressing this characteristic and refreshing “Swiss feeling.” The fragrance collection is the “baby” of the Victorinox product family. Through the takeover of Wenger in 2003, Victorinox became the owner of a line of fragrances and saw an opportunity. The challenge was to transfer the spirit of the Original Swiss Army Knife into the fragrance world. And, in fact, with their authentic Swiss accents, the fragrances capture the distinctive nature of the Victorinox brand. Victorinox Travel Gear Launched in 1999, the Victorinox Travel Gear collections include luggage, business cases, backpacks, leather goods and travel accessories. Each piece is designed to stand up to heavy travel. With models for various activities, lifestyles and tastes, the product range covers a wide spectrum of needs. The 10-year-old Mobilizer NXT Collection remains a world-famous luggage line and still sets the standard in the industry for classic design, durability and multi-functionality. Victorinox Fashion Victorinox Fashion is targeted to an active generation. The marriage of natural and technical materials ensures comfort and the confidence of always wearing just the right thing in any setting. The fashions include clothing for work and play as well as all kinds of indoor and outdoor activities. The collection was developed for the North American market in 2001 and has established itself as a label with a unique character in just a few years. The apparel appeals to clientele with creativity, functional and technical design, and attention to every detail. All in the family One hundred twenty-five years later, Victorinox is still in the hands of the Elseners. This family business is now run by the third and fourth generation. What’s next? Victorinox officials vow to continue to surprise and excite us with products in the future, because, they say, “innovation is in the company’s blood.” The world waits in eager anticipation for the fulfillment of this promise. A legendary “Nose” Alberto Morillas, one of the world’s most prominent perfumers and the legendary “nose” behind some of the world’s most successful perfumes for women and men, is also the man behind the new Omega Aqua Terra fragrance for men. When Omega turned to Alberto Morillas to create a special fragrances, the perfumer was faced with a particular challenge: to represent OMEGA accurately, he needed to create a scent which was elegant and sporty in equal parts and which would convey OMEGA’s values: authenticity, substance and innovation. It also needed to project the qualities which characterize OMEGA’s customers: courage, self-confidence and independence. More than a hundred of the most exclusive raw materials were blended to create OMEGA Aqua Terra and the result is a long-lasting fragrance with energetic, sophisticated, sensuous aspects. experiment with; in addition, each time you analyze a work of art you perceive it differently. This can depend, for example, on your surroundings or your state of mind. When you work you are in a very special world. What do you do to re-enter the “real world” when your working day is done? Do you “switch on” and “switch off” your nose? As a perfumer, work does not end when you leave the office; you are constantly discovering new smells, both good and bad! While driving home, when you are taking a walk, while cooking a new dish or maybe attending an exhibition. All these experiences can be sources of inspiration that develop into the initial idea for a new creation. Do the scents you create have a “signature”? I think every person has his own style . . . this is the case with painters and fashion designers – each one has a signature. I was very influenced by my youth in Andalusia, the sun and the contrasts of this country. Amongst my favourite scents are fruits, flowers and incense. I like to complete my creations with a blend of musks and woods. I find that in a subtle way, these ingredients are the key to enhancing the contrasting elements of my fragrances such as hot/cold effects or light/dark effects. For people who are shopping for a new scent, is there such a thing as nose exhaustion? What tips would you give to someone for their fragrance shopping? A relationship with a fragrance needs time to develop; therefore, I would advise people to select a few fragrances and ask for a sample to wear for a few days. Living with a fragrance is the best way to find one that is right for you. Trust your instinct and change fragrance only when you are ready. Finally, in layman’s terms, how would you describe the new OMEGA Aqua Terra fragrance for men? It belongs to the woody aromatic family. On the top, the fragrance opens on a blend of citrus (bergamot-grapefruit-tangerine-petitgrain) and herbs (clary sage). They bring a fresh and natural sensation to this perfume. After a few minutes, the heart of the creation reveals a spicy freshness and an elegant floralcy thanks to the aromatic herbs, jasmine, red pepper and violet leaves. Finally, the drydown unveils its mysterious facets: a trail of sensual and luxurious woods, refined oak moss, patchouli, vetiver and musk rounds the perfume out harmoniously.